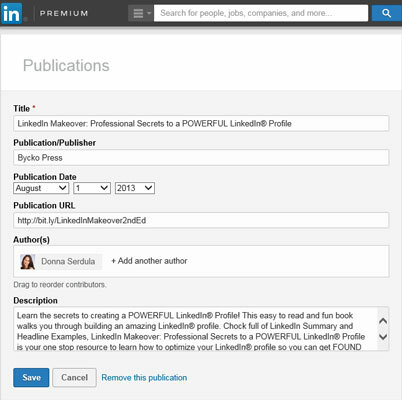 The Publications section of LinkedIn is the place for writers to add published work. This section is a great place to spotlight your writing ability and showcase your knowledge. If you have the Publications section already added to your profile, simply scroll to it and click the pencil (edit) icon to enter into edit mode, then go to Step 5. If you don’t have the Publications section added to your profile yet, scroll below the Contact Information section at the top part of your profile and click the View More link to see a full list of sections to add. In the Publications section, click Add Publications. When clicked, the Publications section appears on your profile. In the Title field, enter the name of the publication. In the Publication/Publisher field, enter the name of the publication if it’s a magazine or periodical, or the name of the publisher if it is a book. In the Publication Date field, choose the month, day, and year the text was published from the drop-down lists. In the Publication URL field, add the website address where more information on this publication can be found. If your publication is a book, you might consider adding a link to the book on Amazon. If it is an article you wrote, add a link to the article. If this publication doesn’t have a web presence, skip this section. In the Author(s) field, add the name of a first-degree LinkedIn connection to tie them to the publication, if applicable. If you are the sole author, skip this step. When adding additional authors, they have the opportunity to add the publication to their profiles (or not). The authors’ names will not be linked to the publication, and the publication will not show up on the authors’ profiles, until they approve. Your name is always listed first when you add a publication to your profile. To rearrange the additional author’s name, simply click a name and drag it into the desired order within edit mode. If you remove the publication after the additional author added it to his or her profile, the publication will remain on that author’s profile. In the Description field, provide some detail around the publication. This is a great place to add a boilerplate description of the books and/or articles you’ve published, and you can even provide a brief excerpt. LinkedIn allows a maximum length of 2,000 characters, which is approximately 300 words — just enough room to provide context, but not enough room to write a novel. Adding a book to the Publications section.